An aromatic curry is a soothing dish as the cold weather approaches, and this spicy flavourful Thai scented curry with coconut milk, red peppers, water chestnuts and fresh lime and basil leaves, will definitely warm you up! 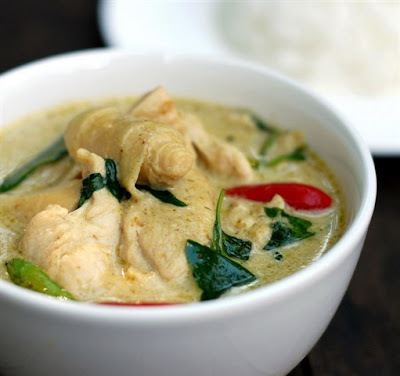 A harmony of satisfying tastes and textures, Chicken in Thai Green Curry is a feast for the eyes, nose and palate. Lovely served with a small bowl of Jasmin rice on the side, this Thai curry is one of our favourite recipes, whatever the weather. 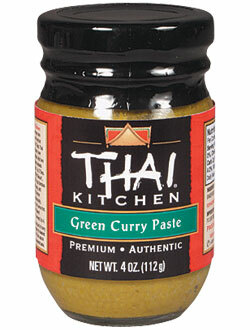 'Thai Kitchen' makes the cooking process even easier with their Green and Red Curry Pastes which you can find in most grocery stores these days. These pastes are also great as a marinade for grilled chicken and seafood, and brushed with a little coconut milk, you'd think you were in Bangkok. 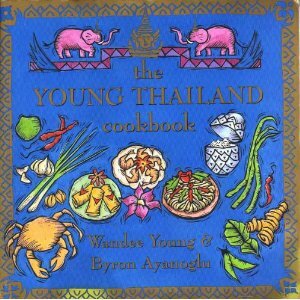 I was first introduced to Chicken in Thai Green Curry at 'Young Thailand', a wonderful Thai restaurant in Toronto, run by Wandee Young, who is credited with opening the first Thai restaurant in Canada in 1980, and also co-writing a cookbook with Byron Ayanoglu — The Young Thailand Cookbook — a great cookbook with many of the Thai culinary classics written in a clear, concise and entertaining manner. 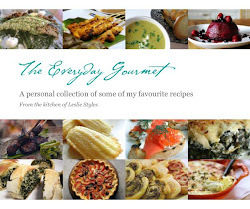 For anyone wanting to know more about "tastes that tingle your tongue", this is the recipe and cookbook for you. Slice the chicken breasts into thin strips, 1/4" thick, 2" long and 1" wide. Heat 1 cup of coconut milk in a wok or large saucepan, over high heat until it boils. Add green curry paste and, reducing the heat to medium, stir to dissolve it in the coconut milk. Add second cup of coconut milk, raise the heat to maximum and let it cook 8-10 minutes until the sauce thickens somewhat. Slice the lime leaves into thin strips and add to the sauce. Turn the heat back to medium and cook for 2 minutes. Turn the heat back to maximum, adding the chicken, then add the last cup of coconut milk as well as 1 cup water. Stir-cook for 1 minute until the mixture is bubbling happily. Add the fish sauce and sugar and stir-cook for 2 minutes, until it's bubbling hard. Add the bamboo shoots and water chestnuts and stir-cook for 2 minutes. Then add the red pepper, green peas and whole basil. Stir-cook 2-3 minutes, folding all the ingredients together into the sauce. Take the sauce off the heat and transfer to a warmed deep serving dish, topping with a sprig or two of basil, and serve with steamed rice.